Abstact The Formosat-3/COSMIC satellite constellation, performing radio occultation measurements, allows for an adequate measurement density in space and time to determine the temperature diurnal tide typical for one month, i.e., on a monthly basis. In this initial study on the topic we investigated the diurnal amplitude and phase between 4 km and 35 km altitude in different geographical regions in July 2007. The tropical diurnal tide shows a distinctive downward phase progression. The corresponding amplitude is increasing towards higher altitudes but it always remains smaller than 0.5 K up to an altitude of 35 km. Natural temperature variability within large latitudinal domains seems to interfere with the diurnal tide, which complicates the interpretation of our extratropical results. We found maximum temperature amplitude within a day in the afternoon at high latitudes with an increase in amplitude with altitude. The tide is more pronounced in the winter hemisphere. Nearly continuous measurements at synoptic land stations, ships, and buoys allow an adequate determination of the diurnal tide of atmospheric parameters, e.g., temperature or humidity, at the surface. Some of these data are available since the end of the 19th century. From 1950 until 2004 a decrease in the diurnal surface temperature range occurred due to a steeper increase in daily minimum surface temperatures than in daily maximum surface temperatures (Vose et al. 2005; Easterling et al. 2006). Since 1979, however, no change in temperature range is observed (Trenberth et al. 2007). 1979), since radiosonde, lidar, and radar data were the only measurements available in the free atmosphere. To estimate the diurnal tide in the free atmosphere it is necessary to analyze data from radiosonde measurement campaigns with at least four radiosonde ascends per day (e.g., Seidel et al. 2005; Alexander and Tsuda 2008), to examine lidar/radar data (e.g., Revathy et al. 2001; Riggin et al. 2002) or to investigate satellite data (e.g., Zeng et al. 2008). The lack of long term measurements in the UTLS region prevents the examination of a possible climate change impact on the diurnal tide in the free atmosphere. In the recent past, discussion about temperature trends in the free atmosphere derived from (Advanced) Microwave Sounding Unit (MSU/AMSU) satellite data received much attention. Discrepancies in sign and magnitude of the trends arose from incorrect inter-calibration and correction procedures between the different satellites (e.g., Karl et al. 2006). 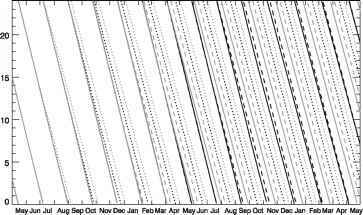 Radio occultation (RO) data (Kursinski et al. 1997; Steiner et al. 2001), however, are self-calibrated, and inter-calibration between measurements of different satellites is, in principle, not needed (Foelsche et al. 2009). Continuous RO data, available since 2001, are thus suitable to perform climate monitoring and related change analyses such as of the diurnal tide, because the data are expected to be stable on a long term basis (Foelsche et al. 2008). A satellite's inclination and its orbit altitude determine the drifting rate and hence its local time sampling. The RO mission CHAMP (CHAllenging Minisatellite Pay-load) yields the longest available RO data set, but since the CHAMP satellite only drifts by three hours within one month, it is not able to observe the diurnal tide within one month, nor within one season (e.g., Pirscher et al. 2007). To determine the diurnal tide with CHAMP data, it is necessary to merge data from different years. In doing so, Zeng et al. 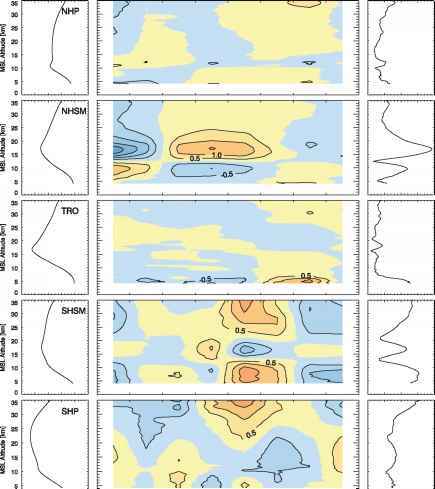 (2008) removed atmospheric seasonal and interan-nual variability. Until 2006 no RO mission was able to sample at all local times within one month. However, the six Formosat-3/COSMIC (Rocken et al. 2000; Anthes et al. 2008) satellites, launched in April 2006, are able to observe the diurnal tide of a measurand within 10 days at low latitudes. We used these data to estimate the temperature diurnal tide at different latitudes and vertically from 4 km to 35 km for an example month (July 2007). Section 2 gives an introduction to local time sampling with the Formosat-3/COSMIC constellation. Section 3 briefly describes the data set and the method used to estimate the diurnal tide. Results are discussed in Sect. 4. Section 5 closes with a summary and conclusions. where J2 = 1082.63 x 10-6 is a constant factor describing the Earth's polar oblate-ness, ae = 6378.137 km is the Earth's mean equator radius, a is the semi-major axis of the satellite's orbit, i its inclination, and n = n(a) is the mean motion of the satellite [rad s-1] (Hoffmann-Wellenhof et al. 1997; Larson and Wertz 1997; Boain 2005). As can be inferred from Eq. (1), the orbit parameters i and a yield the precession rate of the satellite. It is often referred to as the Earth's mean motion of 360°/365.242199d = 0.9856°/d, resulting in ¿0 (¿0 = 0.9856°/d - ¿). Figure 1 depicts the consecutive orbital raising of the six Formosat-3/COSMIC satellites and the effects on their drifting rates with respect to the Earth's mean motion from May 2006 until May 2008. Complementarily, Fig. 2 shows the equator crossing times. The satellites were raised from about 520-800 km while the inclination i = 72° was kept constant. The respective orbital drifting rates decreased from ¿20 ^ 3.33°/d at 520 km to ¿20 « 3.02°/d at 800 km. The gradual change in drifting rate results in a (desired) orbital separation. Shortly after launch (April 2006), all satellites were close to each other. In June 2006, FlightModel-5 (FM-5) was the first satellite which separated from the others because of its orbital raising and the resulting slower drifting rate. By the end of May 2008 all satellites were separated from each other but the final constellation was not fully developed because the solar panels of FM-3 are stuck resulting in non-optimal power and limited payload operation for this spacecraft (D. Hunt, UCAR, pers. comm. May 2008). For this reason, the orbit raising for FM-3 has been halted in July 2007. It is currently not clear, if it is possible to raise FM-3 to its final altitude to 800 km. The precession rate of a satellite determines the sampling behavior with respect to local time. Thereby, it is convenient to refer the precession rate to the mean motion of the Earth of 0.9856°/d. Satellites with orbital precession rates equal to 0.9856°/d are in a Sun-synchronous orbit (¿20 = 0). These satellites are never able to observe the diurnal tide of an atmospheric parameter. The larger the difference between the orbital precession rate and the mean motion of the Earth, the shorter the time span to sample through all local times. Figure 3 shows the local time coverage of all six Formosat-3/COSMIC satellites in December 2006 and in July 2007. Each gray dot corresponds to an RO event (as a function of local time and latitude). In December 2006, FM-5 and FM-2 were the only two satellites in their final orbits. Thus, the plane separation was incomplete, which becomes apparent in less optimal local time sampling (left panel). On the other hand, in July 2007 FM-1 was the only satellite still in its parking orbit and plane separation was well advanced. Local time sampling (right panel) was therefore more uniform compared to December 2006 even though not as good as it will be when all satellites are in their final orbits. one month, limiting the monthly reconstruction of the diurnal tide of atmospheric parameters. Formosat-3/COSMIC RO data are provided by the COSMIC Data Analysis and Archive Center (CDAAC) (http://cosmic-io.cosmic.ucar.edu/cdaac/). In this initial study we use CDAAC dry temperature profiles (post-processed profiles, version 2007.3200). Dry temperature is equivalent to physical temperature when atmospheric humidity is small, which is true everywhere above 8-14 km altitude (Foelsche et al. 2008). Since local time is not well sampled in December 2006, we only use data from July 2007 to estimate the diurnal tide. In addition to this data set we use co-located ECMWF (European Centre for Medium-Range Weather Forecasts) analysis data, which are available at four UTC (coordinated universal time) time layers (00 UTC, 06 UTC, 12 UTC, and 18 UTC). Co-location means that the ECMWF profile is drawn from the ECMWF time layer nearest to the RO event time (no interpolation in time) and that the ECMWF field is spatially interpolated to the geographic RO event location, where the co-located RO profile is extracted. This temporal adjustment in UTC (by up to three hours) also yields corresponding shifts in local time. But since we use profiles at all longitudes, all local times are also covered by co-located ECMWF profiles. To determine the diurnal tide, we divide all RO events within one month into five zonal bands with latitude-dependent width (30° or 40°). The specifications of the regions are shown in Table 1. The use of zonal bands prevents the examination of non-migrating tidal modes which are forced by the land-sea distribution (Tsuda and Kato 1989). Table 1 shows the number of profiles considered in the calculation processes. The smaller total number of profiles at high latitudes results from the comparatively small inclination of the Formosat-3/COSMIC satellites of i = 72°. A larger amount of RO measurements is obtained at mid- and sub-tropical latitudes. When comparing the number of profiles at high southern and high northern latitudes within three hours local time, the asymmetric local time sampling can be seen best. A lot of RO events at high southern latitudes in the early morning correspond to only a few measurements at high northern latitudes at the same time. Twelve hours later, local time sampling is opposite - more measurements occur in the Northern Hemisphere than in the Southern Hemisphere. The most uniform local time sampling is obtained in the tropical region. July 2007 allows for all local times to be sampled sufficiently within three hour intervals: there are always more than 180 RO events in polar regions, more than 500 events in the subtropics and midlatitudes, and more than 800 measurements in the tropical region within each three hour time interval. (Foelsche et al. 2008), i.e., due to convergence of meridians towards the poles the geographic area per latitude increment shrinks by cos y. Anomalies for each region are derived by subtracting the mean profile (i.e., average over all time intervals). The amplitude is derived by calculating the half of the difference between maximum and minimum temperature at each altitude. The phase corresponds to the local time of the temperature maximum. The determination of the diurnal tide is based on all high quality profiles available in the geographical regions. Since the number of events differs significantly from one to the other time interval, the robustness of the calculation method was investigated. This was done by reducing the number of RO events so that they were evenly distributed over all time intervals. The reduced number was thus chosen to be about the minimum number of events available within each time interval. 180, 500, and 800 profiles were randomly selected from the respective set and used for the polar, midlatitude, and tropical region, respectively. The attempt to estimate the diurnal tide with a temporal resolution of one hour was discontinued because the number of events within one hour time intervals was too small. Fig. 4 Mean profiles (left), diurnal tide (middle), and amplitude (rightpanels) in July 2007 calculated with a local time resolution of three hours mean atmospheric temperature structure is typical for a Northern Hemisphere summer month with a well pronounced tropopause in the summer hemisphere. The diurnal tide shows comprehensible results in the tropics that are in very good agreement with other studies, (e.g., Alexander and Tsuda 2008; Zeng et al. 2008). Natural temperature variability within large latitudinal regions with 30° or 40° width and diverse atmospheric characteristics seem to interfere with the estimated diurnal tide complicating the interpretation of extratropical results. Particularly, the mid latitude (plus subtropical) regions (between 20°N/S and 60°N/S) seem to be too large to estimate a "typical" diurnal tide because atmospheric properties are too diverse in that extended latitudinal domain. Therefore, the discussion of the results of this initial study will be focused on the tropical latitudes. The interpretation of the results obtained at high latitudes should be regarded with reasonable care. At high northern latitudes the diurnal amplitude slowly decreases from ~0.65 K to ~0.25 K from 4 km up to the tropopause level near 10 km. Above about 15 km up to 35 km the amplitude increases from ~0.2 K to ~0.8 K. The temperature phase (local time of the maximum) shifts from afternoon (in the troposphere) to early morning (at tropopause level) to afternoon and evening (in the lower stratosphere). At high southern latitudes the diurnal amplitude decreases from ~0.8 K (at an altitude of 5 km) to ~0.5 K (near 10 km). Above that height it increases again to reach ~ 1.6 K at an altitude of 35 km. Maximum temperature in the Southern Hemisphere winter is observed in the early afternoon. In the tropical region, the diurnal temperature tide above about 8 km is less pronounced (amplitude ~0.3 K only) than in the lower troposphere (amplitude reaches ~ 1.2 K near 5 km). The distinctive increase in amplitude below 8 km may be associated with the use of dry temperature which depends on physical temperature as well as on humidity. Dry temperature is colder than physical temperature if humidity becomes important (see also the distinct decrease of lapse rate towards 4 km in the tropical mean profile in Fig. 4). The diurnal variability of humidity in tropical regions may thus cause the observed pronounced dry temperature diurnal tide at altitudes below 8 km. Minimum diurnal amplitude values (~0.1 K) can be observed near 11 km as well as near the tropopause (~16 km). Above 21 km, the amplitude generally increases with height reaching to near 0.4 K above 27 km; below the tropical tropopause the phase remains constant with maximum temperature in the (late) afternoon. It shifts from afternoon to early morning from the tropopause to approximately 27 km. Maximum temperature perturbation above that height is observed at night. This downward propagating phase may be attributed to an upward propagating diurnal tide which is caused by tropospheric water vapor heating rather than stratospheric ozone heating (Chapman andLindzen 1970). The tropical vertical structure of the diurnal temperature tide, particularly the phase, is in good agreement with investigations of Alexander and Tsuda (2008) and Zeng et al. (2008). Even though an increase in diurnal amplitude with height is noticeable in Formosat-3/COSMIC RO data, it is smaller compared to the other studies (e.g., 1.2-2.2 K around 30 km in Zeng et al. (2008)) and only amounts to < 0.5 K at an altitude near 30 km. Results obtained with a reduced number of Formosat-3/COSMIC profiles (flat number for all zonal bands and time intervals) are similar to the results discussed above (not shown). From this we infer that the results are basically robust, i.e., they do not depend on the number of profiles or sample details. The diurnal tide obtained from ECMWF profiles co-located to Formosat-3/ COSMIC RO events (not shown) is also in good agreement with results obtained from RO data. This result is not unexpected, since Formosat-3/COSMIC data are assimilated in ECMWF analyses. Best agreement is observed in the tropical region, with some minor differences noticed in high latitude regions: at high northern latitudes maximum temperatures are predominantly observed in the afternoon (no maximum in the morning) and the amplitude at high southern latitudes is less pronounced. The diurnal tide of temperature was determined and analyzed in the atmosphere between 4 km and 35 km in selected geographical regions (five zonal bands with 30° or 40° width), based on Formosat-3/COSMIC RO data of July 2007 (Northern Hemisphere summer month). The satellite constellation consisting of six single platforms enables the estimation of the diurnal phase and amplitude on a monthly basis. An increase in diurnal amplitude is noticeable in the tropical lower stratosphere but it always remains smaller than 0.5 K (considerably smaller than in other studies with sparser data sets). Maximum temperatures in the tropics show downward phase progression from late afternoon to evening. At extratropical latitudes atmospheric variability is determined by a combination of physical processes so that it is not possible to estimate a "typical" diurnal tide for these regions in the large-scale domains of this initial study. 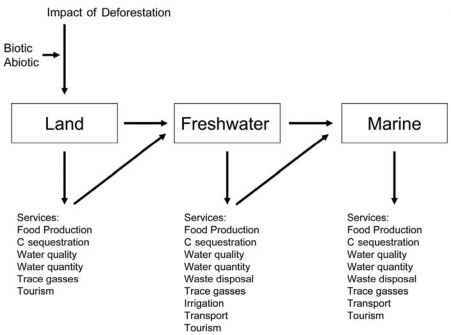 Geographical domains have to be selected carefully. On the one hand, the latitudinal width of regions must not be too large because the mean profile has to be representative for a region. On the other hand, a sufficient number of RO profiles is of high priority. Work on choosing the optimal size of the geographical regions for the given RO data set is currently on-going. In order to estimate the diurnal tide with Formosat-3/COSMIC RO data in months other than July 2007 a longer period of data from the satellite constellation will be analyzed. Since mid-2007 local time coverage is sufficient to allow the observation of the diurnal tide typical for one month. Annual/longer term variations of the diurnal tide cannot be properly determined until the second half of 2008; then local time coverage is sufficient for more than one year of data. Acknowledgements We thank CelesTrak (Colorado Springs, CO, USA) for the provision of Formosat-3/COSMIC Two-Line Element-files, UCAR/CDAAC (Boulder, CO, USA) for providing Formosat-3/COSMIC data and ECMWF (Reading, UK) for analysis data. The work was carried out with financial support from the Austrian Science Fund (FWF) under research grant P18837 (CLIMROCC). UF received financial support from the Max Kade Foundation (New York, NY, USA) and from UCAR.